The Casse-Gueules defeated the Rouge & Gore 161-142 in an all-Roller Derby Quebec final at the 2015 Beast of the East roller derby tournament on Sunday at Arena St-Louis. Montreal Roller Derby League’s Filles du Roi came in third place. The first half of the final was a high scoring affair in favour of the Casse-Gueules, as they entered halftime with a 100-58 lead following strong jams from jammer La Trappeuse. The Rouge & Gore mounted a comeback thanks to the help of jammer Minnie Small. With their lead reduced to 144-123, the Casse-Gueules maintained an offensive mindset and racked up a few more points as they broke down the Rouge & Gore defense. La Trappeuse and Casse-Gueules teammate Booty Allan, as well as Rouge & Gore’s Minnie Small and Fifi Vatebecher, received the MVP honours following the match. Last year, the Casse-Gueules reached the final, but lost to the Gore-Gore Roller Girls. This year, they knocked out the defending champions in the quarterfinals with a 58-25 victory. In the semifinals, the Casse-Gueules and Filles du Roi squared off. Unfortunately for Les Filles Du Roi it was not a close encounter as they lost 83-29, forcing them to play in the third place match against the Slaughter Daughters. Les Filles du Roi eventually regrouped to capture third place with a thrilling 116-110 win. Despite holding a 76-71 in the second half, the Filles du Roi lacked discipline and soon found themselves with only two players in play. As a result, the Slaughter Daughters received 20 points, giving them a 91-76 lead. Coming into the game’s final jam, La Grande Noirceur from Les Filles du Roi scored 14 points to secure victory for her squad. 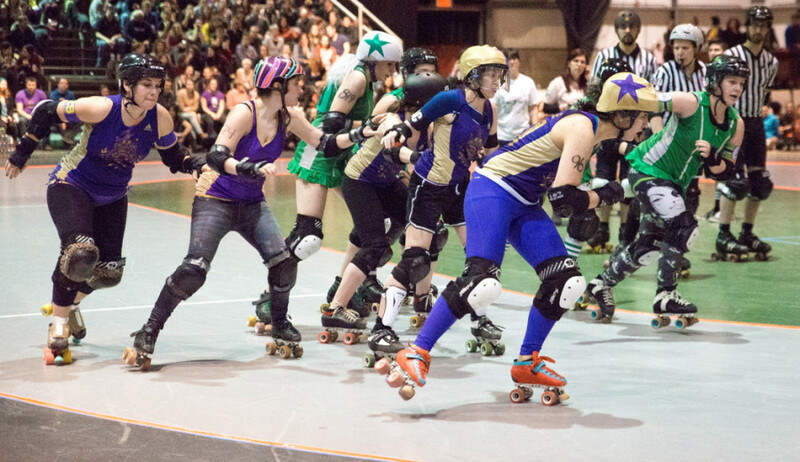 The Montreal Roller Derby League had two other teams in the tournament. La Racaille exited in the quarterfinals, while Les Contrabanditas bowed out in the quarters. The annual three-day Beast of the Easts tournament began on Friday night with the Montreal’s New Skids on the Block rallying to beat Toronto’s CN Power 180-171 in an exciting all-star game. The New Skids led 22-3 after six jams before the CN Power closed the gap and built a lead. Toronto scored 15 to lead Montreal at 70-34. Montreal then cut into the lead, adding 16 points in the next jam while CN Power’s Smoka Cola was penalized twice and New Skids’ Mel E Juana breezed through the opponent’s confused defense. Toronto’s squad were up 86-64 at halftime. In the eight jam of the second half, Falcon Punch’s 18-point jam gave the New Skids its first lead since the beginning of the match with a score of 106-93. After several lead changes, the New Skids retook the lead back when Mel E Juana added 20 to the board. With her team down 171-158, CN Power’s Bala-Reina sought to make a comeback, but she was penalized in the process. Nonetheless, she made an attempt at racking up points by avoiding a block by jumping over the line. In the end, it wasn’t enough. New Skids’ Demanda Lashing and Mel E Juana, as well as CN Power’s Mad Megz and Santa Muerte were each named the MVPs of the game.